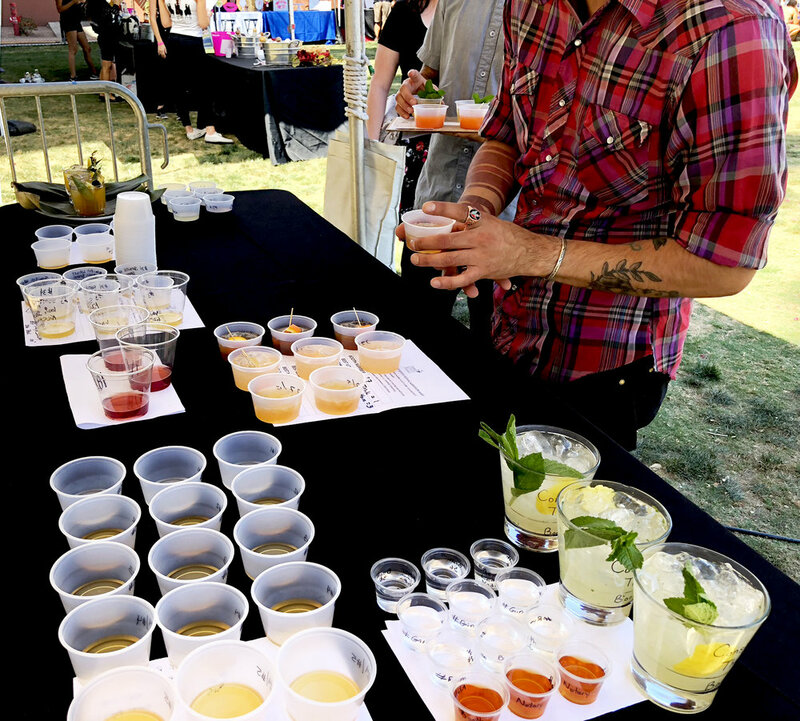 This year the Chandler Craft Spirits Festival celebrated its fifth year of providing an opportunity to sip and savor the burgeoning craft spirits scene in Arizona. It was an impressive list of purveyors, featuring an always-growing list of Arizona distilleries that are producing fine spirits. I have to thank Christina for being the one who turned me on to good cocktails and educating me in spirits. Having really only enjoyed wine and beer previously, she exposed me to vintage cocktails and truly expanded my palate and appreciation of the cocktail arena. When we met, I would order sweet cocktails and the occasional margarita… also tending toward the sweet side. She would always have me try what she ordered and would explain what was in it and generally sharing a story behind her love of whatever concoction of the day happened to be. Slowly, my palate changed and I learned to enjoy cocktails that were more bitter and spirit-driven. Now, years later, I avoid sweet cocktails (just as I avoid sweet wines) and always ask the bartender for a recommendation of what they wish more people would order (a lesson I learned from Guess Who). I now can even enjoy a nice digestif after a meal, including Fernet Branca, one of Christina’s favorites, and truly an acquired taste. When Christina was unable to attend the Chandler Craft Spirits Festival due to a conflict, I jumped at the opportunity to take her place. The organizers asked if I would also substitute for her as a judge in the spirits competition. My first reaction was “no”… I had never done that before and didn’t know if I truly had enough knowledge to be an effective judge. But after talking to Christina, she gave me the confidence to do it, by telling me that I had enough experience now as someone who appreciates a good cocktail and fine spirits. So I stepped out of my comfort zone and agreed to do it. When I arrived on the day of the event, the contestants had started to bring over their submissions and the table began to fill up. I was very excited to learn that my co-judges had experience in this realm and, I was sure, could help me if had any questions: Maggie Holquin-Banks (@whiskeyiseverything) and Lisa Carrington (@cocktail_maven). They carried me through and I learned so much throughout the process. Thank you, ladies. As we were getting to know each other and figuring out the lay of the land... how the competition was structured... the table kept getting more full, to the point that there wasn’t room for any more. We also learned we were not judging just one submission from each participant but some provided up to seven different samples for us. I was getting very overwhelmed (even texting Christina a picture and asking her “What did you get me into, LOL”). We agreed on a structure (1 to 5 rating for each category – each different spirit had its own category, and there was also a wine, beer and cocktail category as well) and then decided it was time to just dive in. Due to the warm weather, it was appropriate to start with the cocktails, whose ice was beginning to melt. Most of the cocktails were presented in plastic glasses (the same glasses that the public would enjoy) but a few were smart enough to add to the presentation of the cocktail and bring real glassware with special adornments. We did our best not to have this affect our judging and truly base the score on what was in the glass. However, it is true that our top two winners happened to be presented in the glassware. I believe, though, that this is more a representation about how much thought went into the cocktail as a whole, which happened to also extend out to include the glassware that it was presented in (and not the reason they earned our top scores). It was very difficult to choose a winner and we had a lot of discussion about it how to decide. 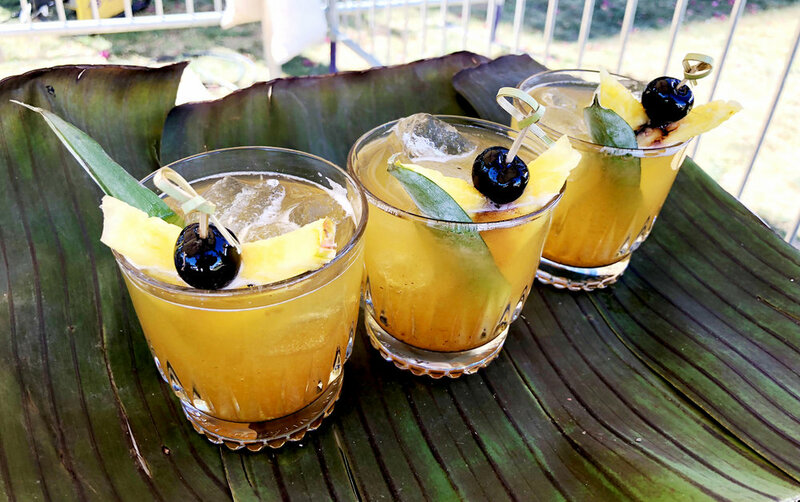 It came down to the fact that the winning cocktail had a great amount of creativity and balance, showcasing unique flavors that outshone the rest… that winner was the Piña Mescalito from the upcoming Las Palmas Cantina restaurant (moving into the old Vintage 95 location in Downtown Chandler in May 2018). We learned that this will be the signature cocktail for the new restaurant and was inspired by a visit to Playa del Carmen by owner Julian Wright. The cocktail features smoky mezcal, grilled-then-blended pineapple, coconut water and agave nectar. It was beautiful and tasty. Our second choice won the People’s winning vote, a cocktail prepared by AZ Distilling Company’s Micah Olson. Micah is well known throughout Phoenix as one of the top mixologists in the area (he was a regular cocktail feature contributor for the magazine I used to publish – Arizona Vines & Wines). It was a close second for us and I’m glad they won the vote from the public. There must have been at least 40 different tastes of lone spirits – basically a shot of booze. It was a feat to accomplish, but we powered through. With a sip or two of each, we found a few specific distilleries that were ahead of the game, and their submissions were smoother and true embodiments of the specific spirit they represented. It was fun to go through this with my two co-judges and to be able to hear their feedback. I was pleasantly surprised to find that I had more knowledge than I’d realized and I felt comfortable hanging with these two professionals, and to learn that I had something valuable to contribute as well. The two producers that stood out to us and won a majority of the categories were Adventurous Stills and Paradox Distillery. I will be checking out both of these companies in the future and can’t wait to visit their locations to explore more of what they have to offer. Because there were so few entries, the beer and wine categories were deleted. Bacon tacos were a much needed alcohol sponge after judging... delicious... from Traveling Monk food truck. After tasting so many spirits, cocktails, beers and wines, I didn’t have an opportunity to partake in much of the event afterward; however, the place was packed and everyone appeared to be having a great time. There was live music, food trucks and a pig-petting farm (from The Whining Pig). I had a blast and will be back next year. And the moral to the story… step out of your comfort zone, try something new, realize that you probably know more than you think… and just have fun.